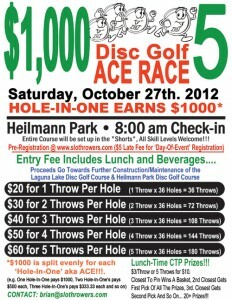 SLOThrowers 5th Annual $1000 Ace Race!!! How Much Can I Win? $1000, Duh! 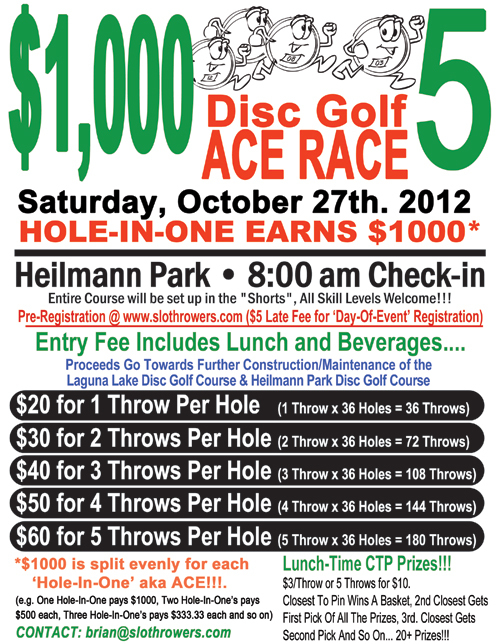 All you have to do is make a ‘Hole-In-One’!!! With all the throws you get… it’s pretty easy right? Lunch Time CTP Competition: We’ll be giving away another Innova Basket during our lunch time CTP Competition! Closest To The Pin WINS! And.. as always… 2nd. Closest gets FIRST Pick of all the donated prizes… 3rd. Closest gets SECOND Pick of all the donated prizes.. and so on… OVER 20+ PRIZES To Choose From! All Preregistration’s are GUARANTEED a Player’s Pack ($20+ Value). There will be a $5 ‘Day Of’ Late Registration Fee if you do not preregister. Pre-Reg is CLOSED. SEE YOU SATURDAY!